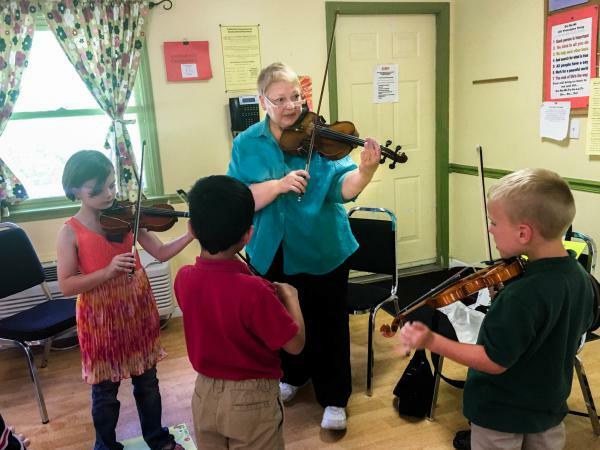 (From left to right) Mackenzie Stamper, Adrian Rodriguez and Luke Ryan attend weekly Suzuki violin lessons with instructor Sara Johnson, part of a training program called MILEStone, or Music Impacting Language Expertise. 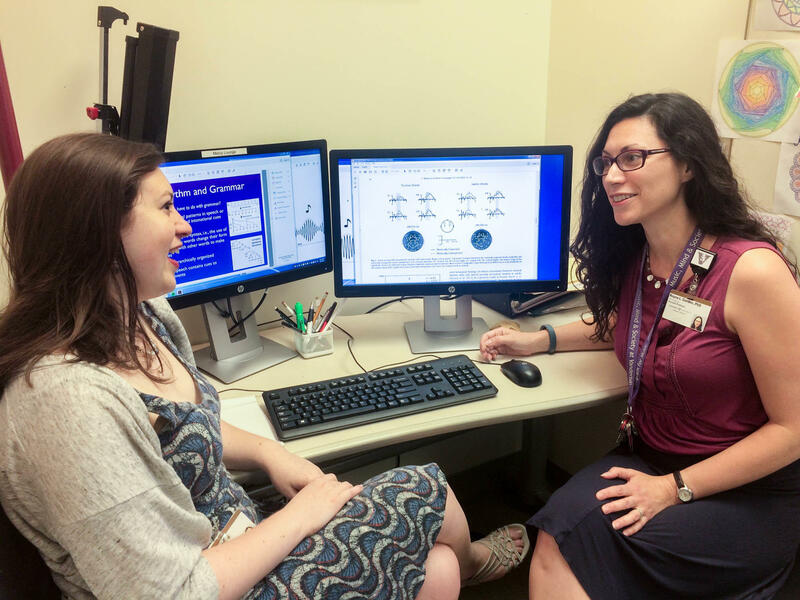 Research analyst Allison Aaron and Assistant Professor Reyna Gordon are studying how music and rhythm training could help children who struggle with language development. Their work is part of Vanderbilt's Program for Music, Mind and Society. Today, Gordon is director of the Music Cognition Lab in the Department of Otolaryngology at Vanderbilt University Medical Center. She studies the connections between rhythm and grammar, and how rhythm and music training might help children with atypical language development. Gordon has previously published research showing a correlation in children between good rhythm skills and a good grasp of grammar. She found children who can detect rhythmic variations in music have an easier time putting sentences together. "One thing that rhythm and grammar have in common is that they both unfold over time, and our brains form expectancies about what's coming up based on what we just heard," says Gordon. Consider the following sentence: The boy read the book that his mother gave to him. "When we hear 'The boy read,' then we're expecting an object after that," Gordon says. "Then when we hear 'The boy read the book that,' then we're expecting an additional clause – something else about the book." By age 5, Gordon says children typically understand and use complex sentences. But studies have shown that about 7 percent of children have what's known as specific language impairment or developmental language disorder, which hinders their language skills even though they have IQs in the normal range and don't have autism or hearing impairment. It often goes undiagnosed. "They have some grammar, but they haven't acquired it at the same rates as their peers," Gordon says. "So expressing complex ideas, especially as they start to go through school, is difficult." In her lab, Gordon studies children with and without language impairment. Some of the kids might already be seeing speech therapists. Gordon wants to see if, in addition, music and rhythm training can help them. On a recent afternoon, 7-year-old Adalyn Patel paged through a picture book with research analyst Allison Aaron, who asked her to describe what she saw and offered prompts. "The dog ran to the door and was barking," Aaron said to Patel. "What does the boy think? Start with 'He...'"
Patel answered, "He thinks the dog is barking at something that's, that's not there." A child with atypical language development might answer the same prompt with just a couple of words. In one rhythm test, kids listen to several musical rhythms and say whether they are the same or different. In another, they mimic a string of spoken syllables, with variations in timing and intonation. Gordon and her team invite families of children who show weaknesses in these assessments to take part in a training program called MILEStone, or Music Impacting Language Expertise. It's a 5-month program the lab created that involves weekly Suzuki violin lessons and a weekly movement class. "There may be something that music training can do to help boost things. Maybe we're able to boost their auditory processing skills in the brain, or something about their rhythm sensitivity in their everyday listening to language, " Gordon says. "We don't know yet, so we actually have a whole series of questions to look at. And while we're in these initial stages I think that music is a fun thing, and if the families are enjoying it, it's a good program to do." Gordon and her colleagues plan to present some initial findings from their research at a conference on music, sound and health in Boston this summer. This week, we're exploring the intersection of music and neuroscience. It's an active field full of researchers and students who think of themselves as musician scientists. UNIDENTIFIED WOMEN: (Singing) Are not your children. They are the sons and the daughters of life's longing for itself. They come through you, but they are not from you. And though they are with you, they belong not to you. SIEGEL: These four women all work at the Music Cognition Lab at Vanderbilt University Medical Center in Nashville. The singing is for pleasure, but their work is about music. Assistant professor Reyna Gordon runs the lab. She's singing second soprano. She's a neuroscientist in the department of otolaryngology. Gordon studies music, language and the brain, something she was curious about when she was an aspiring opera singer. REYNA GORDON: I moved to Italy when I finished my bachelor of music, and I started to take more linguistics classes and to think really about language in the brain and music in the brain and what was happening in our brains when we were listening to music, when we were listening to singing, what was happening in my brain when I was singing. SIEGEL: She says a combination of curiosity about those questions and stage fright as a singer led her to a graduate program in France in Marseille. GORDON: When I got there, the first day I got to see some pilot work that was being done. They were using electroencephalography, so EEG, putting sensors on the head to noninvasively measure brain activity while people were listening to sentences and while people were listening to musical excerpts. And I was instantly hooked. SIEGEL: At Vanderbilt, she's part of the interdisciplinary program for Music, Mind & Society. Dr. Gordon has found a correlation in children between good rhythm skills and a good grasp of grammar. Children who can detect rhythmic variations in music also tend to have an easier time putting sentences together. She's investigating the connection between those two skills. GORDON: One thing that rhythm and grammar have in common is that they both unfold over time, and our brains form expectancies about what's coming up based on what we just heard. SIEGEL: Think of listening to a piece of music and keeping rhythm. For example, this anthem of Suzuki music lessons played here by Vanderbilt medical student Alex Chern. GORDON: If we start to clap together, within a couple of claps, you'll have expectancies for the timing, and you'll be able to clap along to what's coming next. SIEGEL: Same thing with grammar, according to Professor Gordon. GORDON: If we hear words that have a particular grammatical function, we have expectancies for the words that are coming up after that. SIEGEL: So an example of that. GORDON: The boy read the book that his mother gave to him would be a complex sentence that's unfolding over time. When we hear the boy read, then we're expecting an object after that. And then when we hear the boy read the book that, then we're expecting an additional clause after that. SIEGEL: Something about the book. GORDON: Something else about the book, yeah. SIEGEL: Reyna Gordon says that by age 5, children typically use and understand complex sentences like that one but not all kids. She says research shows that 7 percent of children cannot. They have what's called developmental language disorder or specific language impairment. GORDON: They have some grammar, but they haven't acquired it at the same rate of their peers, so expressing complex ideas, especially as they start to go through school, is difficult. GORDON: Nope, they have IQ in the normal range. SIEGEL: They don't have autism. GORDON: They don't have autism. Their hearing is normal. Their brains are just a little bit different. SIEGEL: Some of these kids might already be seeing speech therapists. Professor Gordon wants to see if in addition music and rhythm training can help. Her lab is studying kids with language impairment and also kids who don't have it. They're using EEGs and various tests for both rhythm and grammar. Here's research analyst Allison Aaron with 7-year-old Adalyn Patel who can create complex sentences. They're looking at a picture book. ALLISON AARON: The dog ran to the door and was barking. What does the boy think? Start with he. ADALYN PATEL: He thinks the dog is barking at something that's not there. AARON: Great thinking; next page. SIEGEL: How might a child with developmental language disorder answer? AARON: What does the boy think? UNIDENTIFIED CHILD #1: He - he's barking. UNIDENTIFIED CHILD #1: I don't know. UNIDENTIFIED CHILD #1: We'll see. SIEGEL: All true statements but not stated in complex sentences. Adalyn also does well on a test of speech rhythms. UNIDENTIFIED MAN: Ma ma ma. AARON: Good job. Repeat it exactly how you hear it. SIEGEL: Children with language impairment may have a harder time detecting those variations in timing and intonation. UNIDENTIFIED CHILD #1: Ma ma. SIEGEL: Professor Reyna Gordon's lab at Vanderbilt has assessed around 50 children for this study. She says in children with language impairment, sensitivity to the rhythms of speech and the rhythms of music is less developed. GORDON: So we were wondering if this was something that we could change and whether that would then have an impact on their language development. SIEGEL: Which takes us back to Suzuki at a more elementary level. SARA JOHNSON: OK, ready, go. JOHNSON: We were mostly on the A.
SIEGEL: Sarah Johnson teaches this group lesson, a Suzuki violin class. The students, Luke Ryan, Adrian Rodriguez and Mackenzie Stamper, range in age from 6 to 8. They've all undergone assessments in Dr. Gordon's lab and shown weaknesses in rhythm and grammar skills. JOHNSON: What's a rhythm we can play these letters on? UNIDENTIFIED CHILD #2: F sharp. SIEGEL: These kids also get one-on-one lessons and ultimately five months of learning violin. JOHNSON: Or this one (playing violin). SIEGEL: After 30 minutes of Suzuki, there's a half hour movement class led by Lyn Bingham on piano. UNIDENTIFIED PEOPLE: Flick, flick, flick, flick, flick, flick, glide. Flick, flick, flick, flick, flick, flick, glide. SIEGEL: The idea is to move to the music, to start and stop, to glide and make flicking or punching gestures on cue. Right now, all of these lessons are paid for by grants. SIEGEL: Professor Reyna Gordon says the project has already gotten past some anticipated obstacles. The children show up for the lessons, they practice at home and their parents are supportive. Mackenzie's mother, Megan Stamper, sees progress already. MEGAN STAMPER: She was having trouble understanding what you're saying, and with these classes that she's taking, it's really helping her to unlock that channel of listening, focusing, taking directions. SIEGEL: Reyna Gordon says it's too early to proclaim success, but she is encouraged by what she's seen. GORDON: There may be something that music training can do to help boost things, so maybe we're able to boost their auditory skills, their auditory processing skills in the brain or something about the rhythm sensitivity in their everyday listening to language and that could bootstrap improvements. We don't know yet, so we actually have a whole series of questions to look at. And while we're in these initial stages, I think that, you know, music is a fun thing and, you know, if the families are enjoying it, it's a good program to do. SIEGEL: In recent years, studies of music and neuroscience have taken off. There's better brain imaging, better data processing. There's more public recognition of this kind of work and more funding for it. Part of the Vanderbilt project's funding comes from the National Institutes of Health. We'll hear from the director of NIH and his musical collaborator, opera singer Renee Fleming, on tomorrow's program. UNIDENTIFIED CHILD #4: Whoa. Transcript provided by NPR, Copyright NPR.